In the latest issue of Nature magazine, researchers K.Shimizu, H.Ishikawa, D.Takao, T.Yagi, and K.Amaya of Osaka University report observing superconductivity in lithium under extreme pressure. 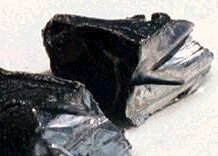 Using a diamond-cell anvil to produce pressures as high as 48 gigapascals (480,000 atmospheres), lithium displayed superconductivity at a "balmy" 20 degrees Kelvin - giving it one of the highest transition temperatures (Tc) of all the elements. Lithium has for years been predicted to be a possible superconductor. The Shimizu group finally confirmed its status by observing the sudden loss of electrical resistance that is characteristic of superconductors. The article quotes Dr. N. W. Ashcroft of the Laboratory of Atomic and Solid State Physics at Cornell University as saying under pressure, lithium takes on structures "quite unlike" the familiar body-centered-cubic (BCC) phase, including structures that have an even number of atoms in the unit cell. Previous attempts to find superconductivity in lithium at ambient pressures have failed (JC Davis Group, UCB, Sept. 1998, et al) - even at temperatures down to 5 mK. Similar research on lithium superconductivity was also just completed by the Carnegie Institution of Washington's Geophysical Laboratory. The complete Nature article can be read at this link (subscription required).